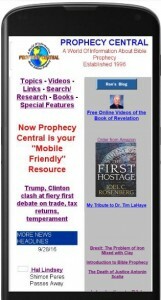 Our site has been a primary source of balanced information about Bible prophecy and world events. More than 100 topic sections give links to relevant Bible passages, current news, and other resources. Headlines about issues relating to End Times prophecy, and news summaries for all these articles have been stored for the benefit of researchers. Some pages go back to the 1996-97 time period. During the past decade it has become increasingly important for Internet sites to be useable on cell phones and other mobile products. Users of these devices have always been able to access Prophecy Central, but our wide-screen format required them to enlarge the sections they wanted to read. So, at last, we have converted our site to Google’s “mobile friendly” standard. Help us spread the word. It is especially important for our younger generations, who use these mobile devices the most, to know what the Bible teaches about the End Times, and about the glorious Gospel of Jesus! This entry was posted in Apologetics, Eschatology, Evangelism, Mobile Devices, Personal Computers, Prophecy Central, Revival and tagged Apologetics, Bible prophecy, Jesus, Mobile Devices, Prophecy Central, Revival, youth. Bookmark the permalink.